Halloween is almost upon us, which means that time is running out for preparing an extensive seasonal activity. 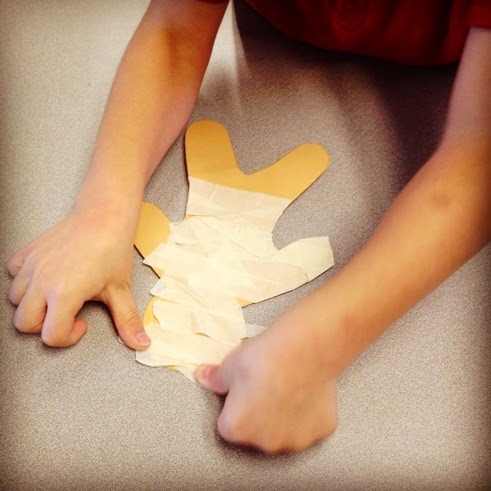 If you are still looking for a last-minute thing to do with your kiddos, this craftivity takes little prep and materials that are readily available in a school. I bought two books featuring mummies this year: "Where's My Mummy" by Carolyn Crimi and "Skeleton Meets the Mummy" by Steve Metzger. I read one of these books with my groups (I mixed it up - some groups got to listen to the Crimi book, other groups got the Metzger book). We worked on listening comprehension and vocabulary. 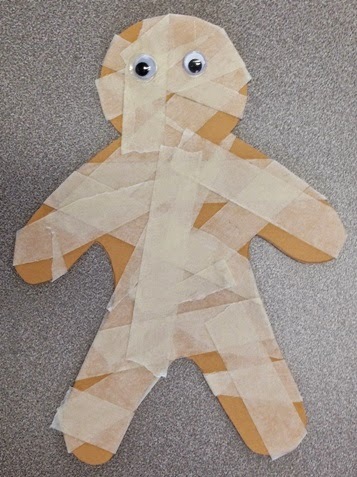 Afterwards, we made mummies by taping strips of masking tape onto a pre-cut construction paper body. Last, we glued on the eyes. Easy! This would also be a great activity for artic groups: students receive a piece of tape after producing their sound x number of times.